BitTorrent Token Sale: Success or Tron Pump & Dump? 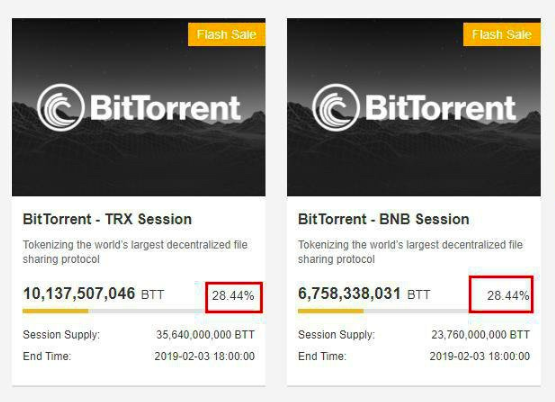 The January 28th, 2019 BitTorrent Token (BTT) sale, has been hailed as a phenomenal success. According to several top crypto news portals, insatiable demand for BTT tokens caused an ‘overload experience’ on Binance’s ICO launchpad site. However, actual investors are much more skeptical. BitTorrent is the worlds leading and most commonly recognized brand of peer to peer torrent software. Using BitTorrent, millions of worldwide users share and sync files daily across the Internet. However, in June 2018, BitTorrent was acquired by Justin Sun, the founder of Tron ($TRX). Shortly after Tron acquired BitTorrent, BitTorrent announced that it was developing a dedicated BitTorrent token as part of a project called Atlas. Project Atlas itself would allow people to earn BitTorrent tokens ($BTT). Specifically, by seeding files across the BitTorrent network. Users would also be able to use BTT tokens to pay for expedited file downloads. Conceptually, BTT tokens are the ultimate utility tokens. Global file-sharing on fixed and mobile Internet connections. Currently accounts for 3% of overall Internet downstream traffic and 22% of global upstream traffic. BitTorrent dominates 97% of this upstream traffic. In effect, Project Atlas promises to use BitTorrent tokens to monetize 20% of all upstream Internet traffic. If successful, this could result in BitTorrent tokens becoming the most widely used payment tokens online. – Potentially making Tron a contender for a higher market cap position in the process. Starting in September 2018, BitTorrent’s Project Atlas and Tron, conjured positive PR surrounding the idea that BTT tokens will pioneer a wave of cryptocurrency and blockchain technology mass adoption. On January 17th this year, Binance then officially announced that it would be hosting an official BitTorrent token sale just 11 days later on January 28th. As the BitTorrent token sale was announced, it was also revealed that it would only be possible to buy BTT tokens with either TRON ($TRX) or Binance Coin ($BNB). As a result, thousands of potential investors scrambled to buy the two tokens. However, as it transpired, only 962 investors succeeded in buying BTT tokens therafter. Was BitTorrent Token Just Part of an Elaborate Pump and Dump? Given the above, several critics are calling the $BTT token sale nothing more than a pump and dump. Specifically, because pre-sale hype saw TRX prices get pumped by a third from $0.02 on January 17th, to $0.03 on January 27th. However, controversy surrounding the BTT token sale doesn’t end here. The actual BitTorrent token sale on January 28th, ended just 18-minutes after it officially began. However, only 962 traders were able to buy BTT tokens. The majority of Binance users who bought TRX and BNB tokens in advance of the BTT token sale, experienced freezes on Binance when attempting to buy BTT tokens. As a result, very few were able to. It has also been revealed that Binance prevented 28.44% of BTT tokens intended to be made available to the public never were. While the matter cannot be definitively proven, it has been speculated that the 28.44% of BTT tokens reserved by Binance ahead of the official token sale, might have been a gift to Binance from Tron. Possibly, a gift made to help Binance artificially pump BTT token prices and (possibly) facilitate the very platform freezes which made it impossible for anyone to buy BTT tokens during the BTT token sale itself. Source: Binance Admits To Pump & Dump? By offering in the same platform services that let a user buy Bitcoin, invest in a token sale and trade distributed tokens, Binance is virtually controlling the investment process of a token, from inception to distribution. This is what originated all of these pump & dump claims and is demanding some sort of clarification and transparency from Binance, that is yet to come. As a potentially more serious problem on the horizon for Tron and BitTorrent, some are now also questioning whether Project Atlas will ever become a reality. Simon Morris, former Chief Strategy Officer at BitTorrent, has revealed that the Tron network itself is (in his opinion) not capable of tokenizing BitTorrent network traffic. If Project Atlas does materialize, it is possible that BitTorrent tokens could rise in value as existing BitTorrent users start monetizing their upstream traffic. However, ultimately, what investors need to ask themselves is whether or not this was just another marketing play from Justin Sun, or if we’re going to have a pleasant surprise this year.